Without going too far out on a limb this morning, a simple recipe is in store for this last Thursday of September. For those still enjoying fresh leafy greens from the veggie garden, here's a super easy salad dressing. You can dress your red cabbage (easy to grow, too) chopped up and mixed in with your fresh greens or you can use it strictly as a ‘slaw’ dressing. It’s a great addition for a fall barbeque salad, too! It’s a recipe I discovered from CD Kitchen while looking for an ‘easy’ sweet and tangy salad dressing. If you adjust and play around with its few simple ingredients, you can find the right dose of sweetness or tang. With dressings this simple, you should never consider one of those expensive bottled ones from the store. Plus you’ll recognize all these ingredients, unlike the list of unknowns on the supermarket’s version. Whisk together and serve over your salad, it’s that easy. With parsley removed from the ‘grow list’ this year, I opted for no herbs with this recipe. But I’m a Romano cheese girl rather than Parm so I did sub that one. I used the precise measurements the first go around but I wing it now and go less sugar, more olive oil to reduce the sweetness a bit. I’ve also added more cheese and tried less, depending on what flavor I’m looking to achieve. There are lots of things to add, subtract or change to this base recipe. But with a dressing so uncomplicated, it keeps things simple on your greens. On that ending note, let’s take a bit of advice from Aristotle. “Change in all things is sweet.” Including your salad dressing! Why the flower picture when the topic is dressing? Most often times, these are the prettiest shots. 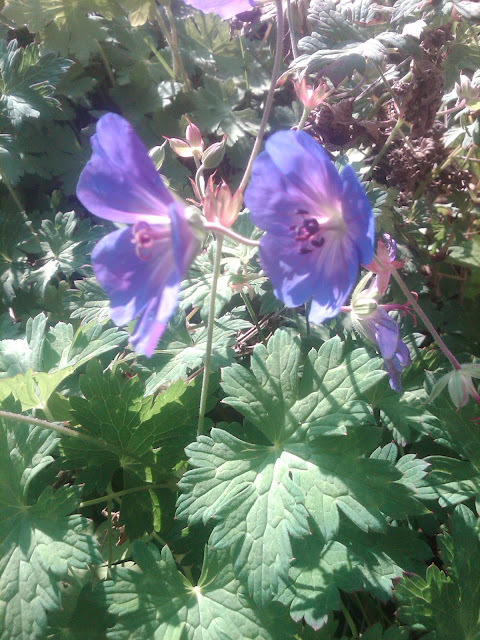 Plus, this dynamite perennial, Geranium 'Rozanne' is still sporting some wonderful blossoms in late September. That’s the extra Thursday tidbit.